Inequality is integral to the climate crisis. Climate change disproportionately impacts marginalized people, who suffer climate impacts more severely and lack the resources and influence to demand or create the necessary changes. Our economic system also drives the climate crisis through short-term incentives and profit motives that contradict sustainability. Please join over 200 organizations from more than 50 countries around the world in endorsing this Statement! Scroll down to read the summary. Once your organization has made a formal decision to co-sign, please email us the name of your organization, along with your country or region (or “international”). Please write “Co-sign Climate Call” in the email subject line. Send to: info@initiativeforequality.org. Thank you! 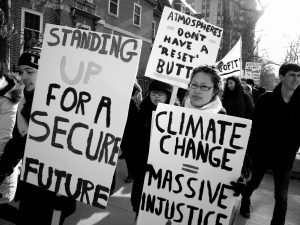 Socioeconomic inequality is an integral part of the climate crisis, and must be addressed. Climate change disproportionately impacts poor and marginalized people and communities, who suffer climate impacts more severely, do not have the resources to respond or adapt, and lack the resources and influence to demand necessary changes. Climate change particularly impacts women and girls. Climate change is also a factor in the migration crisis. Climate change hurts the poor or marginalized more than the rich, compounding existing inequalities. Inequality is a key driver of the climate crisis. Inequality lies at the root of unsustainable behaviors. Inequality makes it socially acceptable for some people to have far more than others, and ties consumption to social status, promoting over-consumption. Our economic system also drives the climate crisis, as growth, short-term incentives and profit motives systematically contradict sustainability. Inequalities, both within and among nations, block agreements and pathways that could lead to sustainability. Within nations, socioeconomic inequalities reduce cultural diversity, depriving societies of potential models for more sustainable ways of life. Overwhelmed with problems caused by inequalities, societies cannot turn their energy towards the transition to sustainability. Between communities and nations who do not share common interests and responsibilities, agreement to address climate change is unlikely to be found. Socioeconomic inequality, by eroding trust and creating social fragmentation, blocks cooperation and joint problem-solving. We call on the world’s governments, nations and communities to recognize that inequality is an integral part of the climate crisis; that those who did the least to precipitate the crisis are likely to be harmed the most; that developed countries have a moral and legal obligation to support developing countries in adapting to climate change; and that all countries should support their most vulnerable communities. greater democratization of decision-making, in which vulnerable communities play a leading role in determining how best to achieve social resilience, mitigation and adaptation. Grenada Community Development Agency (GRENCODA) – Grenada.